As I have said many times before, my family is big on outdoor activities. Whether it's fishing, cookouts,whatever during the warm months we are mostly outside. That's why I want to share this product with my readers. The Waterproof Bluetooth Speaker by Volemon. It's a small speaker, which makes it very portable, but the sound that comes from it is amazing! It has Bluetooth V2.1 + EDR Technology that allows instantaneous connection (3 seconds). You can play your music either through Bluetooth or through auxillary. It's built in battery allows you to play your music for 4.5-7 hours. It has a USB charger included. There's also a lanyard included to make it easy to carry around your wrist if you're walking or hiking.There's a built in microphone for hands free phone calls too. The Bluetooth has a range of up to 33 feet, so you aren't tied to your phone or device's location. You can move around, workout, whatever activity you're involved in. I'm still in awe of the sound that comes from this speaker! It's a powerful 81 mm diameter speaker and Enhanced Bass Resonator. You won't believe your ears either. 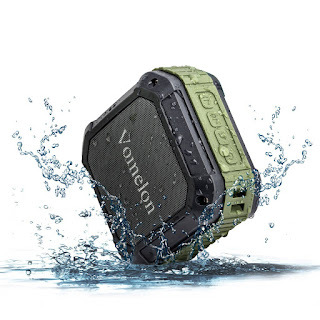 My husband wants a waterproof bluetooth after he saw the one my teen has. THis one sounds perfect for him! This is nice and a great idea for my son to use. Thanks for review. Great idea! Would be perfect for our backyard. My grandchildren are going wacky about this speaker! This would make an awesome gift for my relatives in California who have a pool. I also like the look of the speaker....very stylish. Waterproof is definitely the way to go.